Serena Williams showed that being a mother was not going to stop her from playing tremendous tennis at the BNP Paribas Open Friday night. The American played two tight sets of tennis against Victoria Azarenka to win 7-5, 6-3 on Stadium One at the Indian Wells Tennis Garden. This marked the first time the two played as mothers making it a special moment for International Women’s Day. They last met at the tournament in 2016 where the Belorussian won the championship in straight sets. Neither one has been at their best since giving birth to their children with Azarenka going in and out of tournaments this season. Williams ended a seven-match winning streak back at the Australian Open losing in the quarterfinal to Karolina Pliskova. 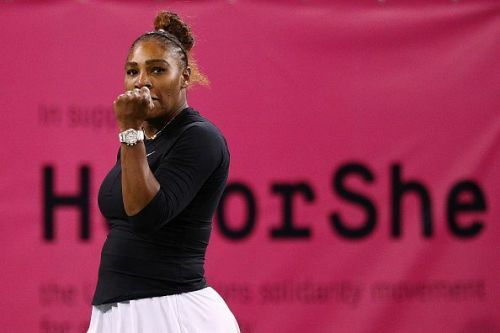 In what was her first match since late January, her opponent had the upper hand going in after taking control of her first-round win Wednesday. She followed Williams who got the match started with a service hold before saving two break points to get hers locked down. Williams got even after four after fighting with her in the third which saw four breaks and two double faults from the American. Williams made it three in the fifth that allowed Azarenka to get ahead. The tenth seed forced deuce but failed to get an AD point opportunity giving the 29-year-old the lead. She didn’t contain it for long as the double faults started to increase for the Belorussian. She had two in the sixth that once again leveled the score at three-all giving Williams the time to find her moment to strike. She held for just the second time scoring winners out of the reach of Azarenka. Her time to strike arrived during a time when the Belorussian committed another double fault that led to a 0-40 hole. She managed to recover one of the points but no more leading to William’s 5-3 lead. With Azarenka facing the American’s serve, she fought for every point getting chances for the break before a dramatic net front rally ended with the 29-year-old lobbing one in for the victory. She made sure to move around during the tenth on serve where she scored a serve to love against the tenth seed evening it to five-all. With a three-game comeback, the Belorussian had Williams cornered with little room left to maneuver. She battled the frustrations in the 11th to force deuce on serve where after five breaks, Williams got the key winner to give her the step ahead. The 12th was another fight between the two with the tenth seed once again getting a key edge on the score that allowed her to break and win the set after 1 hour and 12 minutes. It was clearly a match of each player taking the other for a whirlwind with both suffering on serve percentages and double faults where they combined for ten. Williams opened the second set with a mix of good and bad elements that saw a break for Azarenka getting it on a forehand error from her opponent. The tenth seed recovered the mistakes with a break of the Belorussian in the second and a hold in the third where her offense got slightly better. Azarenka discovered ways to stay tight with Williams getting easy points on errors from the returns. They went through six games staying close to one another until a key hold in the seventh gave Williams an edge with the set close to a conclusion. She dug into the eighth determined to lose Azarenka at all costs. Despite a push to deuce by the Belorussian, Williams attacked the backhand side of the court to win the AD point and serve for the match at 5-3. The American was determined to get the job done and on her first match point, the 37-year-old went slightly wide on a return to end a good rally between the two. On a winning corner, Williams earned a second chance but double-faulted for the ninth time. It gave Azarenka a shot with the AD point but that and a second one went awry. Williams was saved from having to play another game getting a third shot to end her night which came to end a two hour and seven-minute battle.
.@serenawilliams emerges in an incredible second round battle at the @BNPPARIBASOPEN over Azarenka, 7-5, 6-3! With her first win back in the desert, the former world number one will take her success and reflect it upon Garbine Muguruza who she faces in the third round Sunday.